"Burrage Yale was born in Meriden, Connecticut on March 27, 1781, the son of Amerton and Sarah (Meriman) Yale. Since his family was dependent upon the elder Mr. Yale for support, Burrage set off at an early age to care for himself and assist his father financially. He secured an ample supply of tinware and traveled through various towns and states to sell his goods. 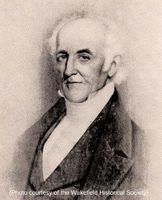 In 1800 his travels took him to Reading, now Wakefield, where he was the guest of the Boardman family of 18 Elm Street. Mr. Yale settled in the community in 1802 and began preparations for the manufacture of tinware. His business eventually blossomed until he became one of the largest tinware dealers in the state with over 100 peddlers. Mr. Yale held few public offices. He served as Town Moderator and Town Treasurer and was very accurate in his statements, accounts and in all the details of his business. He was appointed as the first Postmaster of South Reading on March 16, 1827 and served for nearly three years. His half brother Eli A. Yale assumed the position in January, 1830. Mr. Yale was very generous to the community and its residents and contributed a large sum for the purchase of the fire company engine which bore his name. He died in 1860 at the age of 79." -- Text from calendar by Jayne M. D'Onofrio. 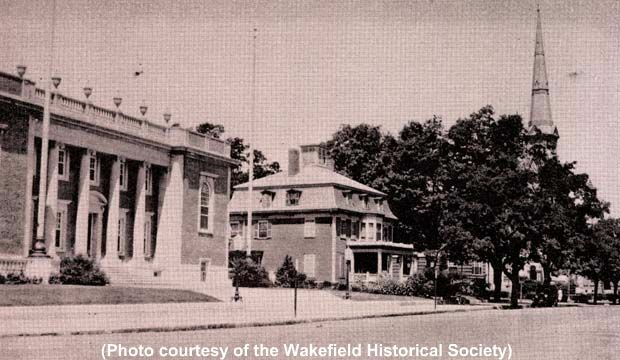 Photos courtesy of the Wakefield Daily Item and the Wakefield Historical Society. “Burrage Yale,” NOBLE Digital Heritage, accessed April 20, 2019, https://digitalheritage.noblenet.org/noble/items/show/6886.